Sony Crackle held a panel at New York Comic Con last night for SuperMansion which revealed a new trailer and some new key art for the show’s original holiday special. 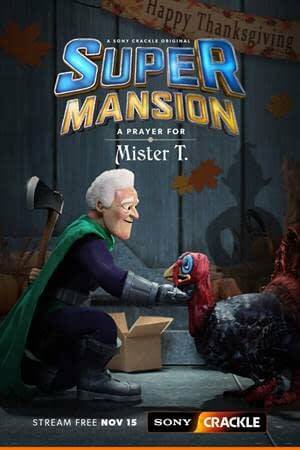 “A Prayer for Mr. T: The SuperMansion Thanksgiving Special“ is set to debut on Thursday, November 15th. Attendees of the panel got a sneak peek at the upcoming SuperMansion special episode with commentary from co-creators Zeb Wells and Matthew Senreich, along with voice-acting star Bryan Cranston, who also serves as executive producer, and guest stars Breckin Meyer and Gary Anthony Williams. The Thanksgiving special will be the fourth special episode for the stop-motion animated series. In the upcoming holiday special, the annual Thanksgiving turkey competition between Titanium Rex (Bryan Cranston) and Dr. Devizo (Chris Pine) goes awry when Rex’s turkey transforms into a nightmarish bird monster whose eggs hatch additional freakish bird creatures at an alarming rate. Lex (Jillian Bell) aims to prove herself worthy of a seat at the grown ups’ table while Black Saturn (Tucker Gilmore) brings The Groaner (Zeb Wells) to his family’s mansion for a traditional Wheelihan Thanksgiving dinner, complete with snobby gherkins and snobbier guests. You can check out the SuperMansion Thanksgiving special teaser trailer below.